November 25th, 6 a.m. As dawn breaks on a cold morning, twenty beams of bright white lights that had been intersecting above suddenly rise together towards the sky, before disappearing just as abruptly. The finale for the light installation “Amodal Suspension” which had been running for 24 days was all too brief, but its afterimage lingered in the minds of those looking on. 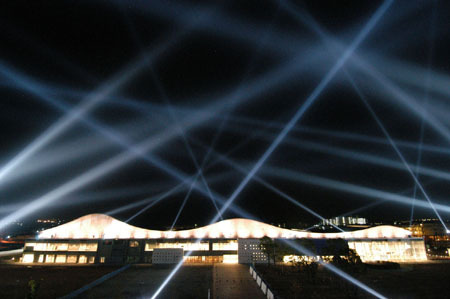 “Amodal Suspension” converted the night skies into a huge communications switchboard, sending out messages sent from mobile phones, computers, or on www.amodal.net in the form of light beams. This project by Mexican-Canadian Rafael Lozano-Hemmer was featured as the opening event for the Yamaguchi Center for Arts and Media (YCAM) and took place between November 1st and 24th. People visiting from Tokyo or other big cities are first likely to be surprised by the rural scenery of Yamaguchi. Despite being the prefectural capital, it’s a small town with a 2-car local line running a few times an hour, no fast trains or airport buses or even a highway interchange. Nodding westwards to Kyoto, the town is arranged in a grid pattern with many alleyways; it is a place where time flows at its own leisure. And it is here that the ultramodern media center YCAM was born, and a huge light installation created by 140,000w of searchlights took place. It’s no surprise voices wondering if an invasion of aliens had hit the quiet skies have been heard. But such worries should disappear once it becomes clear the messages come from all over the world. By visualizing invisible electronic communication, this project was a friendly alien that brought far-away participants closer together. Though the Java applet lagged sometimes, www.amodal.net recorded access numbers of 12,500 from 85 different countries in 10 days. The traffic was 60% in Japanese, 40% in English; access from mobile phones were 98% from Japan. In the end, 9366 messages were archived. It was a great success. Contributing to the success were 27 “Access Pods” set up in art/media centers or science museums in 15 countries, including the MIT Media Lab, Germany’s ZKM, the National Museum of Emerging Science and Innovation in Tokyo, Holland’s V2. These terminals, which allowed people to participate in the experience remotely in real time, were set up amazingly quickly by the centers, who put their confidence in Lozano-Hemmer. In a way, they opened the door for the possibility of worldwide media centers to connect together through a network community. “This project asks questions about the difficulty of telecommunication brought on by technology,” says Lozano-Hemmer, and indeed the system doesn’t allow for smooth conversation. The translation software announces silly results, and someone other than the intended recipient can intercept the messages. What could be taken as a cynical examining of globalization, this inefficient way of communication complete with mistakes and differences, was funnily enough at harmony with the slow tempo of Yamaguchi. Hopes of the future, friends and lovers, best wishes to families. The messages were overwhelmingly about love and peace. Would it be too hasty to detect a sense of hope in the public sky, taken over by messages of peace? November 25th, 6 p.m. There are no more lights. Yamaguchi regains its usual night sky and there are no tracks of any activity left. This is Lozano-Hemmer’s work. Changing the audience’s conscious at a point, but not leaving a trace. Instead, it suspends itself into our memories and fills the images of a new city, and our imaginations. *Rafael Lozano-Hemmer will be participating in fete des lumieres, Lyon, France, from December 3rd to 10th. *YCAM will be holding “Media Sockets” In the public space of the center until December 28th, featuring 6 groups of national and International artists. *A 3D simulation of Amodal Suspension can be experienced on www.amodal.net.